Dallas Fair Park - 37. Briscoe Carpenter Livestock Center. The Briscoe Carpenter Livestock Center is currently being built next to the Swine Building with the expectations that it will be ready for the 2016 season of the state fair. 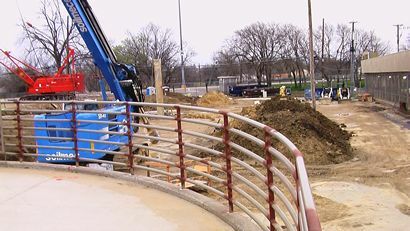 Plans for its construction were made in 2010 after the roof of the Sale Pavilion partially collapsed. The new building will replace the demolished pavilion as the permanent place for auctions. In addition, the two-story structure will also host trade shows, horse events, and livestock competitions. The first floor of the building will feature a show ring, loading docks, sorting pen, a washing section within its 11,000 square feet. On the second floor, there will be a lounge, ballroom, banquet hall, offices, and the Heritage Hall of Honor Museum and Library.